A boundary survey provides the client (land owner, buyer, etc.) with the land surveyor's professional opinion about the boundaries usually in the form of a map. The legal term for this map is "plat" or "plan". A	boundary survey involves finding and locating evidence found along the boundaries of the client's property...and often boundaries of other lots located farther from the site. The surveyor typically provides a paper copy of the plat to the client and marks the lines with paint or flagging and property corners with monuments where needed. Usually provided to engineering companies to be used as a tool for the placement of infrastructure, such as subdivision, retail	development and road placement. This survey is also used to	assess volumes, such as material removed form a pit mine or waste in a landfill. It generally shows the existing conditions on and around a parcel of land at the time of the survey with emphasis placed on elevations measured relative to a known benchmark, frequently mean sea level. If you live in or near a body of water, then you may be required to pay flood insurance under the National Flood Insurance Program. This requirement falls on those who have mortgaged a home or other significant structure or improvement lying within a Special Flood Hazard Area (SFHA). Flood insurers determine whether the lot is in this "flood zone" by referring to Flood Insurance Rate Maps (FIRMs) produced by the Federal Emergency Management Agency (FEMA). A FIRM may show a parcel of land lying in the flood zone; however, the elevation of a building may lie well above FEMA's published base flood elevation (BFE). McNally Land Surveyors can assist with two services. A Letter of Map Amendment (LOMA) application may be submitted to FEMA, and if FEMA determines that the buildings or structures are outside the flood hazard area, then they may issue a letter officially stating that they are not in the flood zone as shown on the FIRM. This also applies to a described portion of the land. An Elevation Certificate form may be completed for the client to submit to the insurer, who may then use the elevation information to provide a better insurance rate. A survey performed for a land owner or developer dividing a large parcel of land into several smaller lots. 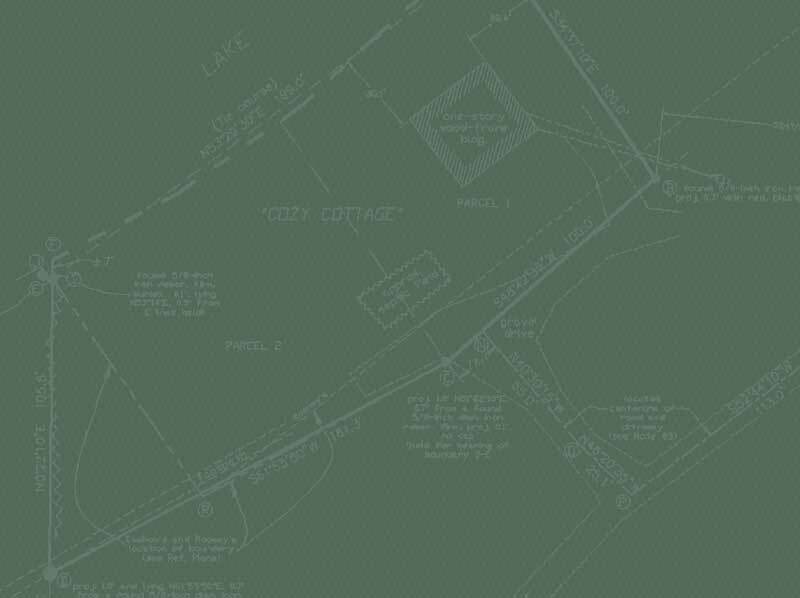 In order to sell off more than one lot the State of Maine or the municipality (LURC in unorganized territories) generally requires that a subdivision application be submitted for its approval. This can include information from boundary surveys, topographic surveys, flood elevation surveys and more. We can also act as representative of the client for presentations made throughout the application process. Using land surveying techniques and additional technology and equipment to map the beds of rivers, streams, lakes and other waterbodies. A plan showing the final locations of recently built structures for a comparison with their original locations. "Where is it, and where was it supposed to be?" Laying out positions of proposed structures for clients, such as engineers or contractors, to guide them where to dig, build, drill, etc. Placement and location of targets on the surface of the earth used by aerial survey companies in photogrammetric applications (surveys performed from photos/imagery take from airplanes or space-born equipment). Provides the client, such as an attorney or an engineer, with technical data or analytical information for assistance or guidance from a surveying perspective. For a reasonable fee, this service is highly recommended to client preparing to sell property or buy property and can include a Deed Description Review for a small fee..
McNally Land Surveyors may assist adjoining landowners in a boundary dispute to expedite an agreement on a boundary's location and to avoid litigation. An attorney still needs to be involved with creating the appropriate documents that will cause the agreements to take effect legally. While not recommended, this service furnishes to a mortgage company, attorney or lending institution a sketch assisting in the completion of a home loan to a potential buyer or refinancer. The information provided on the sketch depends on what is required from the client. An MLI shows only general	locations of boundaries and the location of improvements such as buildings, driveways, utilities. Information shown may include easements and possible encroachments. ****NOTE: An MLI does NOT provide the client, landowner or buyer a professional opinion about the boundary. McNally Land Surveyors always recommends a boundary survey over an MLI, as an MLI gives the client a false "warm and fuzzy" feeling. Provided to anyone needing professional assistance in the preparation or review of a concisely organized deed description of a parcel of land. McNally Land Surveyors is able to plot surveys, color images on banners and large photos for office walls and plotting surveys, etc. Computer-Aided Drafting - Using a computer to precisely and neatly place hand written or digital data into a presentable form, either in digital format or on a hard copy.